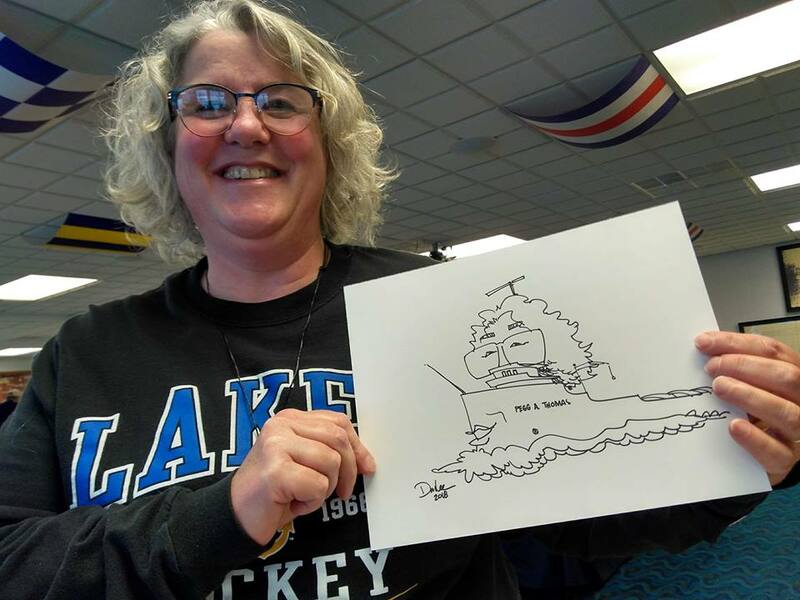 Pegg with a caricature of her as a Great Lakes freighter. Never a dull moment … Pegg Thomas wears a lot of hats. Her most important hat is a crown because she’s the daughter of a King! Her life was bought with the blood of Jesus, and she’ll follow Him into eternity. Besides being an author, Pegg is the Publisher for Smitten Historical Romance, an imprint of Lighthouse Publishing of the Carolinas. Pegg lives on a hobby farm in Northern Lower Michigan with Michael, her husband of *mumble*years. They have an assortment of animals on the place, including a flock of sheep, a flock of laying hens, a couple of barn cats, and Murphy the spoiled rotten dog. They also have a large garden, a small orchard, and a growing berry patch. Besides writing, she enjoys a variety of crafts including spinning her sheep’s wool into yarn, knitting, counted cross stitch, quilting, scrapbooking, and card making. She and Michael enjoy camping, fishing, boat-nerding (you have to be a Great Lakes person to know about that), and thoroughbred horse racing. A life-long history geek, it’s no surprise that historical fiction is her genre. Colonial America and the Civil War era are favorite time periods to both read and write. Her favorite type of book centers on a great fiction story surrounded by factual historical events. Pegg has been a finalist in the 2013 ACFW First Impressions Contest and the 2014 Clash of the Titles Olympia. When not writing or editing, Pegg can be found in her garden, in her kitchen, tending her sheep, or spinning on her antique spinning wheel. Hi Pegg – it was great to see you again at Alpena! Hope we can stay in touch and I look forward to reading your books!